No, no – not like that! The buildings at Heritage Square are staying put, but the contents in a couple of them are being packed up and switched around – renewed, refreshed, and made to better fit our orginization’s vision. Through our Museum Assessment Program process, we’ve been listening to visitor feedback, and are thrilled to make this the starting point of re-energizing Heritage Square into THE cultural destination in the heart of downtown Phoenix. The first step in this move is taking the retail part of the Museum Store (everything but the ticket sales) from the Burgess Carriage House, and combining it with our vintage makerspace in the Stevens Bungalow, creating a fun and funky space for our visitors to shop, craft, snack and relax. The new store will feature pieces from local crafters and artists, workshops for all ages designed to spark creativity, and yummy treats to sit and enjoy. This space will open to the public on July 5th. If you are or know of a local crafter or artist who may like to apply to consign their work in the new store, let us know! Contact our staff about applying at operations@heritagesquarephx.org. 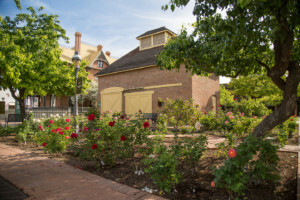 Our next step in re-energizing the Square is turning the Burgess Carriage House into a Visitors Center… Stay tuned to our social media and blog to see how the move is shaping up, and to see the next steps in our efforts to make Heritage Square better every day. Plate Expectations: Victorian Dining, Decorum & Dishes – Learn Victorian dining etiquette, and see beautiful and rarely displayed pieces of our collection in this exhibit at the Rosson House. From olive spoons to chocolate pots, oyster plates to tilting water pitchers, and both historic and prehistoric dining artifacts from archaeological digs at Heritage Square (on loan from Pueblo Grande Museum), this exhibit is sure to show you something you’ve never seen before! Plate Expectations is on display February through October 2018, and is included with Museum admission. You are Here: Mapping Early Phoenix – Visit us this September for this in depth look at what Phoenix looked like a hundred years ago, and how it has changed over time. You are Here is a free exhibit opens this September in the Stevens-Haustgen Bungalow Exhibit Gallery. It is displayed in partnership with the Maricopa Country Recorders Office, and with help from a grant from APS. Special Tours coming to Heritage Square in Fall 2016!